This teeny tiny tin sign is the perfect gift for any happy couple celebrating their anniversary. Whether it’s their first or fifty-first, this sweet sign is ideal for hanging on fridges or on work desks as a reminder of the true meaning of love. 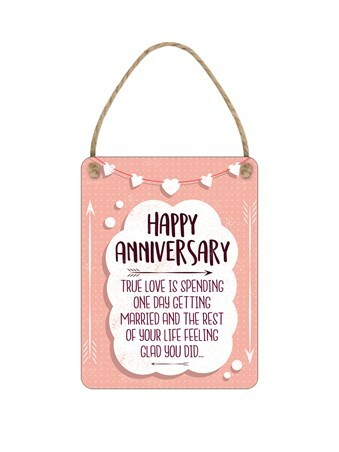 Surrounded by a polka dot pink background and dainty heart bunting, sit the words ‘Happy anniversary - True love is spending one day getting married and the rest of your life feeling glad you did.’ Complete with a natural twine hanger. High quality, framed The Rest Of Your Life, Happy Anniversary tiny tin sign with a bespoke frame by our custom framing service.